The event industry is going green and whether you like it or not you will have to respond to the push toward more environmentally friendly events. But how does an entrenched industry with such a need for big expenditures of energy and resources reduce its footprint? C’mon you build temporary buildings feed thousands at a time drive giant trucks cross-country. You can do it. We’ll show you how. To get you started EM asked a panel of industry experts to share their tips on greening events of all kinds. As we gathered these ideas a few common themes resonated: You can and should start small and take it in phases you should demand green goods from your suppliers and partners you can reduce green premiums by using less and you don’t have to sacrifice luxury to be eco-friendly. “There’s still the perception that when you do something that’s more environmentally sensitive it means it won’t be as nice that you’ll have organic hemp outfits and that there will be some sort of compromise and it won’t look good ” says Kimberley Gardiner national marketing manager at Toyota’s Scion unit and a pioneer in the green marketing movement. “But now there are a lot of varieties and choices that weren’t around even a couple of years ago in the event marketing space.”Rule One: Reduce. Gardiner says “Ask yourself ‘Do I really need this?’ Is it something that’s going to add to the event and make a difference?’ If the answer is no that’s a great place to start.” Rules Two and Three? Reuse and Recycle.Our experts offered piles of other suggestions for greening events. So whether you’re exhibiting at a trade show hosting a hospitality tent installing a pop-up or driving a mobile vehicle cross-country these tips will inspire you to paint your program a brighter shade of green. Ready? Let’s go kids. Rent in-market. Instead of driving or shipping exhibits and materials rent whenever you can. From trade show exhibits and pop-up walls to linens and glassware renting allows durable goods to be reused time and again. It reduces weight on tour trucks which saves on gas and may even allow for a smaller tour vehicle all together. When renting ask for eco-friendly basics like organic linens and glassware. Some companies offer surprising green options like recycled glass platters versus virgin glass options. Replace and reuse. At this year’s Sundance Film Festival Gardiner replaced fabrics made of viscose polypropylene or plastic composites with organic cotton recycled paper and plastic bottle content and recycled polyethylene. The wall treatments curtains and wall hangings added to the artistic impression being made in the Lexus Hybrid space. Gardiner reuses the fabrics at other events saving money and transportation resources. Avoid vinyl. Ditch the traditional toxic vinyl banner and opt for biodegradable or recycled ones. For its four-city Dig It eco-tour in which artists and activists banded together in October through volunteerism and music Timberland had all the graphic materials printed on biodegradable Ecoknit and Ecoprint fabrics (MKG Productions New York City handled). Opt for soy or vegetable ink. Better yet replace banners altogether and opt instead for rentable and reusable plasma screens. Create slideshows where sponsor names and logos show up repeatedly. “In some ways it increases the amount of exposure companies get ” says green event planner Danielle Venokur. Choose sustainable flooring. Try cork and bamboo. Check out websites such as naturalcork.com corkfloor.com duro-design.com (for cork and bamboo) and for recycled rubber visit such sites as rubbercal.com inoflex.com and greatmats.com. Method used FLOR carpet squares (flor.com) made with the lowest Volatile Organic Compound (VOC) emission. The carpet squares fit any size space and can be installed wall-to-wall in minutes. Bonus: they’re easy to replace one square at a time. (Agency: A Squared Group West Hollywood CA) “Sustainable options often end up creating something unique ” says Seelun Mak a senior vp at New York City-based Grand Central Marketing. Go with eco-friendly paint. Opt for low-VOC and zero-VOC paints and finishes. These paints are durable cost-effective and less harmful to human environmental health. Consider sawdust. MDF is a reclaimed sawdust product that works well for countertops and other like environments says Jeff Baker president of Manchester NH-based Image4 an enviro-friendly design agency. Other options: fabrics made from recycled soda bottles wheat boards and environmentally sensitive laminates. Turn out the lights. Work with convention centers and event venues to save as much energy as possible. See if it’s an option to turn lights off (or put them to sleep) over your exhibit at night. Build in natural design elements. Johnson & Johnson’s Olympic pavilion featured 1 500 square meters of bamboo imported from the southern city of Anji in China that was planted among the gardens on the roof and throughout elevations of the structure itself. Shrouding the exterior walls in bamboo created a sustainable passive cooling system that tempered the hot August days in Beijing. Misting machines also helped reduce temperatures naturally providing a cool green oasis on the Olympic Green. Go local and organic. It not only helps the environment but it contributes to the local economy. “Local means less carbon footprint and smaller family farms so you’re supporting your community. Certified organic means maybe they’re flown in but we know they’re from farms where the employees are being treated well and paid fair wages and no toxins are going into the ground ” says Venokur. If you go organic look for Certified Organic. Serve organic fair-trade shade-grown coffees and teas says Rebecca Mebane director of conferences and meetings at the National Recycling Coalition. Offer vegetarian and vegan options. At a three-day 900-attendee conference Lukacs worked with the catering department at the Hyatt in South San Francisco to serve vegan and locally grown food allowing local farmers to bring in fruits and vegetables without additional cost. About 50 percent of attendees opted out of the vegan menu but Lukacs says just offering the choice still made an impact. “Believe it or not going vegan actually has the most carbon reduction. It’s the biggest thing human beings can do to reduce their carbon footprint. I eat meat but I chose the vegan meal because I thought ‘I can do this for three days.’ So we were able to promote that at our conference.” Even the chocolate cake was made without dairy. Limit bottled water. “There’s a lot of evidence that bottled water gets partially consumed and a lot of water gets wasted ” says Deborah R. Popely founder and president of Green Event Source. “People start a bottle and leave it somewhere. If you’re using pitchers of water or water stations people can fill their own cups and they have a tendency to use less.” If you have to use bottled water try to use one with the least amount of plastic in it. Also don’t pre-fill cups or glasses at sit-down dinners. Serve organic cocktails. People love their signature drinks but offering organic wine beer alcohol and mixers can enhance the attendee experience. 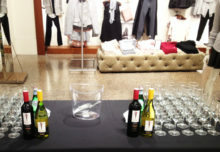 Venokur features organic wines at her events and invites a representative from the winery to talk to guests. “At a corporate event or at a cocktail hour oftentimes people want to learn and chat ” she says. Featuring an organic vodka and mixer can also serve as a conversation starter. Skip the shrimp suggests Shelley Wolfe president of Wine & Dine Events Group. For every 1 000 people who stop eating shrimp more than 12 000 pounds of sea life can be spared each year due to over-fishing. Ask your venue if it has a Chain of Custody certification from the Marine Stewardship Council. Hand out eco-friendly gifts such as water bottles and coffee mugs that guests can fill at coffee stations and water bars suggests Mebane. Earlier this spring Philips gave out free compact fluorescent light (CFL) bulbs to students who attended the Stop Global Warming College Tour which it took to 11 cities on a bio-diesel fueled bus. Visitors to the Burt’s Bees mobile tour walked away with a giveaway that keeps on giving—seed packets (Agency: AMP Boston). Turn last year’s materials into this year’s giveaway. Lexus and McDonald’s recycle their branded vinyl billboards and turn them into stylish bags meant for long-term use. Rethink the branded bag or backpack. If they’re an annual tradition Popely suggests doing what one eco-conscious event planner didn’t do: print the year of the event on the backpacks. “You can use them year after year and people can bring them back year after year ” she says. Same goes for t-shirts. Invite attendees to create clean energy. At this year’s Super Bowl Pepsi-owned energy-drink brand AMP invited attendees to literally fuel the event by grabbing an organic t-shirt and jumping on stationary bikes connected to batteries. More than 1 200 hardworking riders (there wasn’t an empty seat in the house) helped the brand keep the lights microphones and plasma screens on and offset the 30-minute pre-game show on Fox which was sponsored by AMP. Offer community service and team building. Involve attendees in donating leftover food and goods like exhibit furniture that can be repurposed or recycled locally. “Where you’re ultimately going with this is reducing impact on the community in which you’re operating and leaving something positive behind ” says Green Event Source’s Popely. If biodiesel or hydrogen busses are out of the question turn the travel into engaging walking experiences for short in-city hops. Popely says one planner gave conference attendees in Chicago backpacks and pedometers and created a walking path map that transformed the walking back and forth into a wellness activity. “Every day they would rack up miles and there was some sort of recognition for the amount of mileage they had put on ” she says. Capture data electronically. Stop wasting paper by having attendees fill out forms to enter sweeps or other contests. “In a program we executed recently we captured a lot of data so instead of using paper we used PDAs to get the information electronically to reduce all forms ” says Matthew Glass ceo at Grand Central Marketing. Match attendees by geographic proximity by using your website and then encourage them to carpool. “At one of our conferences we put up a website where people were allowed to post where they were coming from ” says Lukacs. As a bonus attendees meet and begin networking ahead of time. Look for venues that offer easy public transportation to and from the airport and around town plus nightlife within walking distance. One year National Recycling Coalition gave conference attendees in San Francisco a three-day Muni pass. At the welcome reception volunteers worked the lobby to show guests where to go. The staff even conducted tours all over the city entirely by public transportation. “We had a tour guide and got them on the bus or train ” Mebane says. The Muni passes weren’t any more expensive than renting a bus but if cost is an issue have a partner sponsor it. Instead of printing materials upload them onto your website or distribute them on jump drives. (CDs are quickly becoming the newest addition to the landfill. Go with the drive instead.) “We used to print handouts for each speaker session and never knew how many people were coming but now we just post it on our website ” says Mebane. “That way folks can go there or just print out handouts for the session they want to attend.” If you have to use paper print double-sided and six slides per page. collect name holders and lanyards for later use. “It’s not that hard to do and it cuts costs too ” Popely says. Place a recycling bin next to every trash can. Champion provides cardboard wastebaskets and biodegradable trash can liners to trade-show exhibitors. Hire your own recycling and composting firm. “If the city doesn’t have recycling work with the host committee ” suggests Mebane. “Or contact a local waste hauler.” Make sure to also check with the facility manager at the venue who may be a better resource than the catering manager. Use china stainless utensils and glassware. It takes 1 000 times more energy to make a plastic fork than it does to wash a stainless fork 1 000 times. “Overall you’re using less energy and producing less waste by washing ” Popely says. Think renewable from the beginning. When building temporary structures like pop-ups keep future programs in mind. “In the planning process with clients we’re thinking of the types of frames we’re using and we create set pieces that can be reused ” says Ted Skala director of design and production at Grand Central Marketing. “Repurposing set pieces for clients year after year makes a difference ” he says. Support local tree-planting organizations. “Instead of buying the carbon offsets and paying the middle man who then buys the offsets through the Chicago Climate Exchange we just give the money directly to a local organization that plants trees ” says Lukacs. “You can calculate how much carbon is absorbed in a tree’s life.” Take it a step further and look for arbor festivals and conservation events to sponsor. Institute green purchasing requirements including shipping methods for your staff and partners. Prioritize local (as in where the event takes place) purchasing. 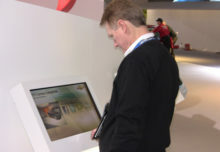 Use an environmentally friendly credit card for fuel purchases says Momentum evp Peter Office. GE Money offers an Earth Rewards Platinum MasterCard for example. When you use it at the pump a portion of your net purchases goes to offsetting the emissions created by your purchases and activities. Spending $500 offsets the emissions from driving almost 1 500 miles in an average car according to myearthrewards.com. Choose a venue with a front-of-house recycling program. “Some hotels and convention centers do back-of-the-house recycling cardboard and in their offices paper recycling but we’re talking more about having recycle bins in meeting rooms and even sleeping rooms for your cans and bottles and newspapers ” says Mebane. One-stop shop. Consider working with one chain of venue or hotel. Hilton for example will have an eco-friendly meetings offering in all of its hotels by next year. Green in-conference room amenities include room-by-room temperature control recycling bins tables made from easily replenishable woods energy-efficient lighting bamboo flooring fabrics with low VOC content and 3M Prestige window film which cuts down on 60 to 70 percent of solar heat and reduces the need for air conditioning. Hilton will also discontinue linen table coverings to reduce water waste and harsh cleaning chemicals. “The enhancements stem from meeting planners who when traveling want consistency knowing they’ll get the same product in London as they will in Chicago and Tokyo ” says Justin Bolin director of operations at the Hilton Chicago O’Hare. Hold events in LEED-certified venues that use Green Seal-certified products and where there’s a strong energy efficiency program and water conservation program suggests Mebane. Or consider A green prefab alternative. Marmol Radziner Prefab recently installed in Venice CA a 2 800-square-foot modular prefab home available for rental and partnership opportunities that features EcoTimber flooring and other green touches. Outdoor venue? Go solar. Sustainable Waves supplies turnkey solar-powered sound and staging equipment to events like the Vans Warped Tour and the Virgin Music Festival. The company also offers super-green solutions like tents with built-in wind turbines and a greenhouse gas algae-eating generator that reduces CO2 emissions by capturing diesel exhaust. Use generators to cut carbon emissions when vehicles idle. Generators also can save gas and reduce emissions when running the radio air conditioner or heat. Or more simply just have the coach company turn off the bus instead of idling.